Nuit Blanche draws criticism -- all answerable. Some say that the event has strayed too far from its original focus on art -- others say that there's too much corporate involvement and focus on cultural tourism. The payback to Toronto is meaningful. I take these concerns seriously. Its impact since 2006 has grown from $1 million to $40.5 million last year, a lot of money flowing into Toronto's economy for just one night. On Saturday, "We've Been Expecting You" signs that are on lampposts around Toronto should prove accurate, but with a twist. About a million people will hit the streets to expect the unexpected. This year's Scotiabank Nuit Blanche promises a wide variety of art and locations, for the first time including Toronto's waterfront. Experience points to several reasons why Nuit Blanche is a hit. It ignites peoples' imaginations through engaging and challenging art. It is an opportunity for a first exposure to visual art for a younger audience and out-of-town visitors. It's a social blender, drawing individuals, families and communities from the GTA and far beyond. Nuit Blanche draws criticism -- all answerable. Some say that the event has strayed too far from its original focus on art, filling the streets with enthusiastic, rowdy young crowds that are out for a good time. Others say that there's too much corporate involvement and focus on cultural tourism. Or they challenge the quality of the art works, finding the art inaccessible. Most importantly, some question the episodic nature of the event, expressing the concern that resources are focused on a one-time experience that does not train and retain an audience for contemporary art. As Chair of the Volunteer Nuit Blanche Advisory Committee, I take these concerns seriously. It is true that Nuit Blanche relies on a mix of public and corporate support -- it is a model for a successful approach to arts funding. The payback to Toronto is meaningful. Its impact since 2006 has grown from $1 million to $40.5 million last year, a lot of money flowing into Toronto's economy for just one night. Rowdy? Perhaps. 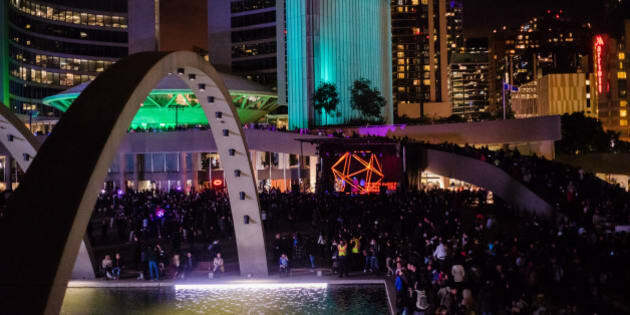 Nuit Blanche is noisy and boisterous, but it's also fun and engages young and old as culturally diverse audiences interact with and comment on art works. Other countries in the world rejoice in cultural events that create a communal spirit around culture. Why not Toronto? We have embraced Nuit Blanche, an arts-based concept that began in Paris in 2002 and spread to Montreal, Bucharest, Riga, Tokyo and now Edmonton. If people scratch their heads about some of the art they encounter, Nuit Blanche is doing its job. Contemporary art plumbs issues and allows its viewers to pause and experience the world in different ways. The City of Toronto and the curators work hard to choose work ranging from the spectacular to the intimate and is of the highest quality. Nuit Blanche draws a wide audience. This is a good thing, one that institutions can build on. To respond to concerns about the lasting impacts of the night, Nuit Blanche has established Extended Projects to ensure that some works are accessible to the public for a longer time. Let's take the opportunity to review and refresh our public art policies in Toronto and find ways to retain some of the imaginative large-scale pieces that are part of Nuit Blanche on a permanent basis. I am proud that OCAD University has been a sponsor and leader in making Scotiabank's Nuit Blanche a 10-year success. Sara Diamond is the president of OCAD U, Canada's largest university of art and design, and the chair of the Scotiabank Nuit Blanche Advisory Committee.